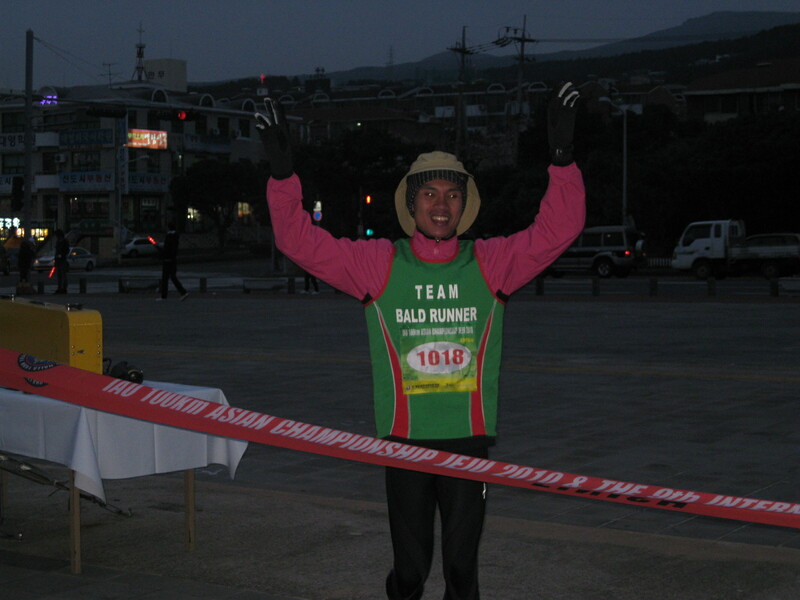 The following is the official report submitted by Hilary Walker, Secretary General of the IAU, as the Official Result of the 1st Asian IAU 100K Championship Race held in Jeju Island, South Korea on March 27, 2010. Early Saturday morning about 500 runners set off from the Tapdong Beach Stage in Jeju, a scenic island at the southern tip of South Korea. The athletes were competing in a number of ultramarathon events ranging from 50K to 200K in distance together with a 148K tough trail event over the mountainous interior of the island. There was a total of 143 runners from 23 countries around the world as well as the local Korean athletes. Amongst these, an elite competition was being held for the inaugural IAU 100Km Championship. Athletes representing the IAU member countries of Japan, Korea, Mongolia, The Philippines and Chinese Taipei were taking part in the championship with other Asian countries, Indonesia, Thailand and Vietnam being represented in the open 100K race. 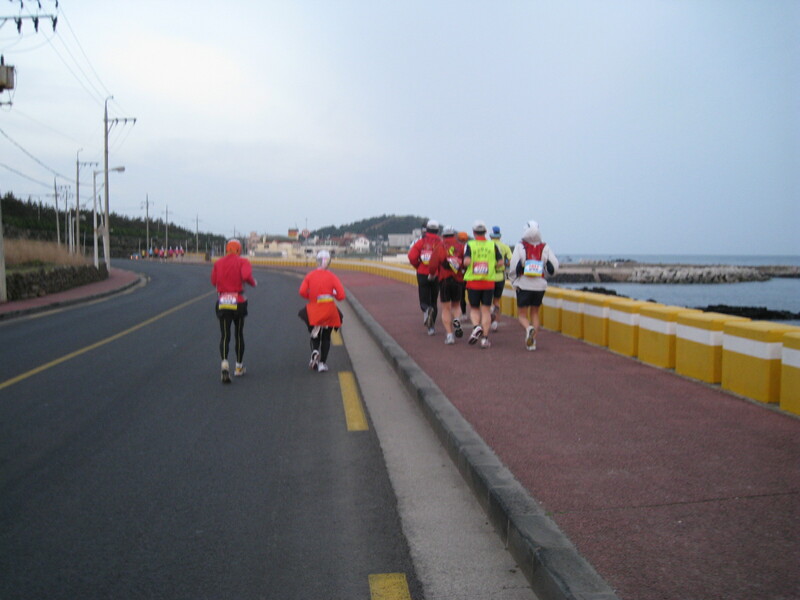 The 100K course was a scenic one, undulating around the west coast to finish outside the Jeju World Cup Stadium in Seogwipo City on the south side of the island. The second half of the course would be tougher for the runners with some long inclines and descents. The weather fortunately was calm but cool. This was a relief to the runners as previous days had been very windy which could have presented a harsh headwind around exposed areas of the course. The pre-race favourite was Yasukazu Miyazato of Japan, the 2009 IAU 100Km World Cup champion with a personal best of 6:40:43 and so, not surprisingly, he was part of the early leading pack of runners. Also in the forefront was the leading Korean athlete Dong-Moon Lee whose personal best was 7:45:13. The other members of the Japanese team, Yasutoshi Oshima and Toru Sakuta, and another Korean runner, Yong-bee Shin completed the leading group. Mai Fujisawa (JPN) showed early in the ladies event. She and her compatriot, Yoko Yamazawa had personal bests at 100K of 7:55:48 and 7:58:01 respectively so a close competition was expected. The leading pack had split apart slightly with Miyazato (JPN), and Dong Moon Lee( KOR) coming through the drinks station together in 2:52. Just behind were Shin (KOR) and Kwang-Yul Lee (KOR) with Sakuta (JPN). Oshima (JPN) was one minute adrift and Dondogdorj (MGL) and Bolivar (PHI) were a further minute behind. There had been no change in the first few positions in the ladies’ race. Fujisawa (JPN) had increased her lead to nine minutes passing through 40K in 3:12 with her Japanese colleagues and Da (TPE) still running together in second place ( 3:23). At 70K, the hillier second half of the course had started to take its toll and the field was now split well apart. Dong-Moon Lee (KOR) and Miyazato (JPN) came through together in 4:57 but the Japanese runner was obviously struggling and retired before the next checkpoint. It was 10 minutes before the third runner Yasutoshi (JPN) appeared, followed two minutes later by his team mate Sakuta (JPN) with Kwang-Yul Lee (KOR). 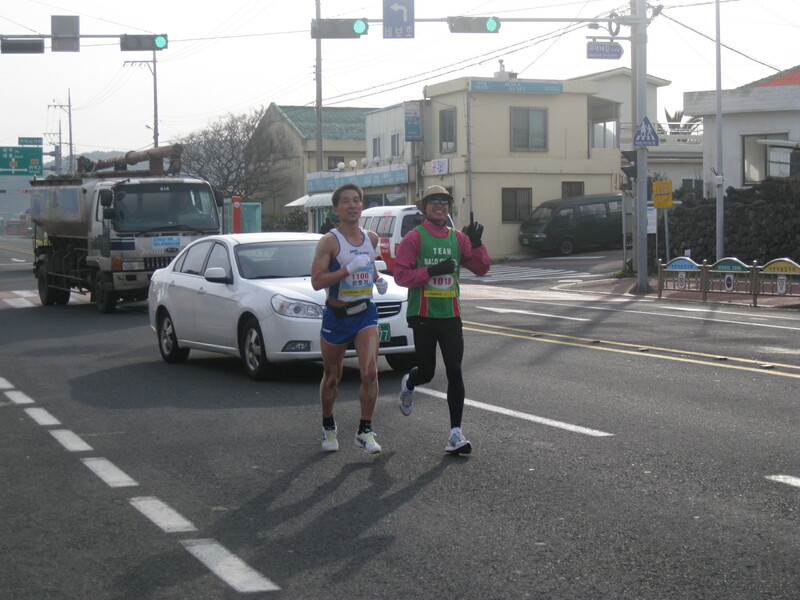 There was a further interval of 16 minutes before the next championship runner, Shin (KOR), passed 70k. The leading lady Fujisawa (JPN) ran through comfortably in 5:31. At the finish outside the World Cup stadium, there was a longer wait than might have been expected for the first runner to come into sight. The last sections of the course had some testing climbs and descents which took further toll on the runners. However , the wait was worth it for the local crowd as the first IAU 100K Asian Champion was the Korean Dong-Moon Lee who finished in 7:23:20, taking a massive 22 minutes off his personal best for the distance. This was even more commendable considering the difficulty of the course. Closing the gap considerably by the finish, the silver medallist Yasutoshi Oshima (JPN) crossed the line in 7:26:45 with his compatriot Toru Sakuta finishing in third with 7.37.36. Mai Fujisawa (JPN) became the first IAU 100K Asian Ladies Champion with an excellent 8:01:32 performance, only 6 minutes outside her best. Japan took a clean sweep of the medals with Takako Asano (JPN) and Yoko Yamazawa (JPN) taking silver and bronze in times of 8:44:59 and 8:53:11 respectively. Of particular note in the concurrent open race was the performance of the Japanese female runner Mami Kudo who finished as the first lady in the open event with a superb performance of 7:56:06. In 2009, she had completed world beating performances at longer ultradistances but hadn’t qualified for the Japanese team at 100k. The leading performances are detailed below. Last October 2009, I received a formal letter from the International Association of Ultrarunners (IAU) informing me that the Philippines had been officially accepted as a member of IAU through the Philippine Association of Ultrarunners (PAU) which I created and organized. IAU officials informed me that the Philippines is the 6th ASIAN member and the 45th member worldwide. 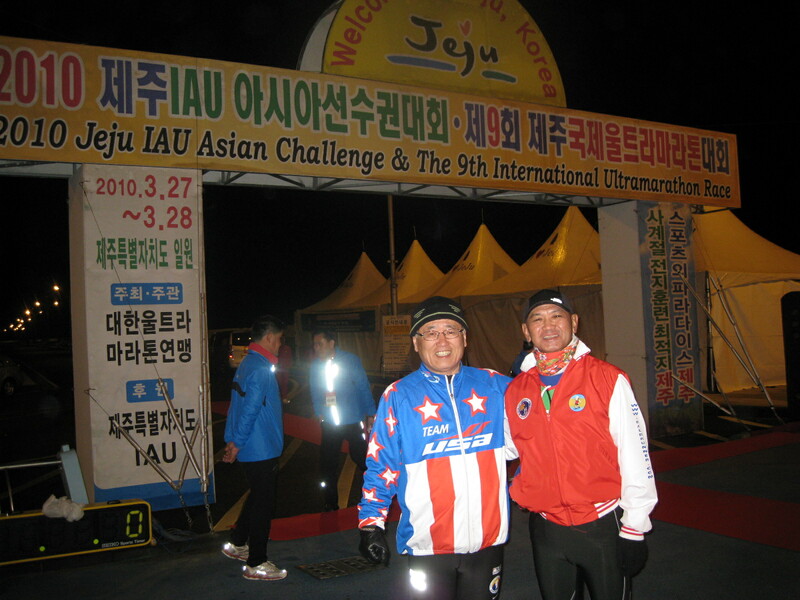 After two weeks, I received an invitation from the IAU for our country to be represented in the 1st Asian IAU 100K Championship Race to be held in Jeju Island, South Korea on March 27, 2010. Attached with the invitation are the protocol and requirements for participating in the said race. The Event Organizer, South Korea’s Ultrarunning Federation, invited 3 men & 3 women whose accommodation and food will be provided free for the duration of only two days. The participating runners are supposed to be the best and most qualified ultra runners that the country could offer. The desire to join in this competition was so strong on my part but the big problem was the logistics/financial support needed for the plane tickets of the athletes. 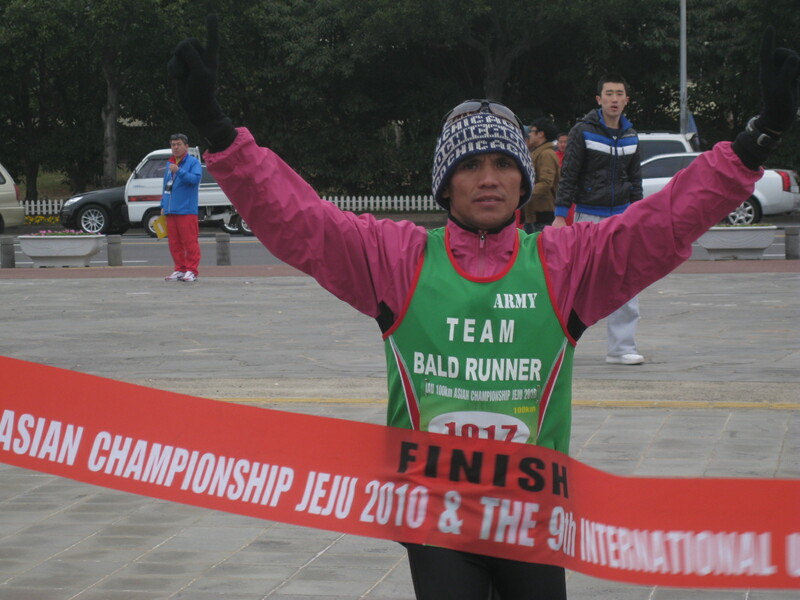 As of November 2009, I met all the members of the Elite Team Bald Runner and asked them who would “volunteer” to train for the 1st Asian IAU 100K Championship Race. 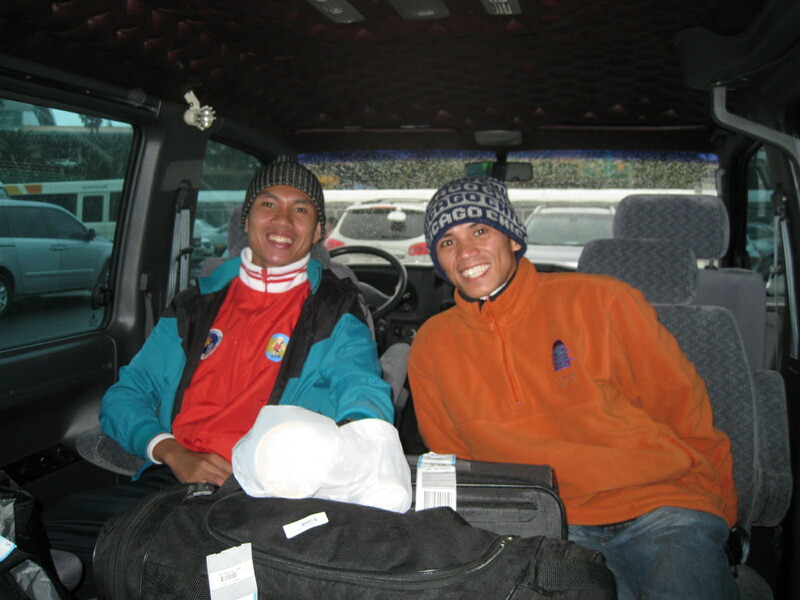 Alquin Bolivar & Frank Indapan came forward to accept the challenge and started to train from then on. Last year, I also thought of sending the top Male & Female Champions of this year’s BDM 102 to Jeju’s 100K Ultramarathon Race but the timing/schedule was not conducive for the best performance of our athletes as they are on their “recovery” mode barely weeks before the event after the BDM 102. Being a relatively new running sports, ultramarathon is “alien” to our government sports officials, moreso, to our friends in the government and corporate world. So, I did not want to be frustrated again to be begging to these “personalities” for some financial support for me to send our country’s representatives to this IAU-sanctioned international event. My experience with the government & corporate world in the 1st BDM 102 will never happen again. 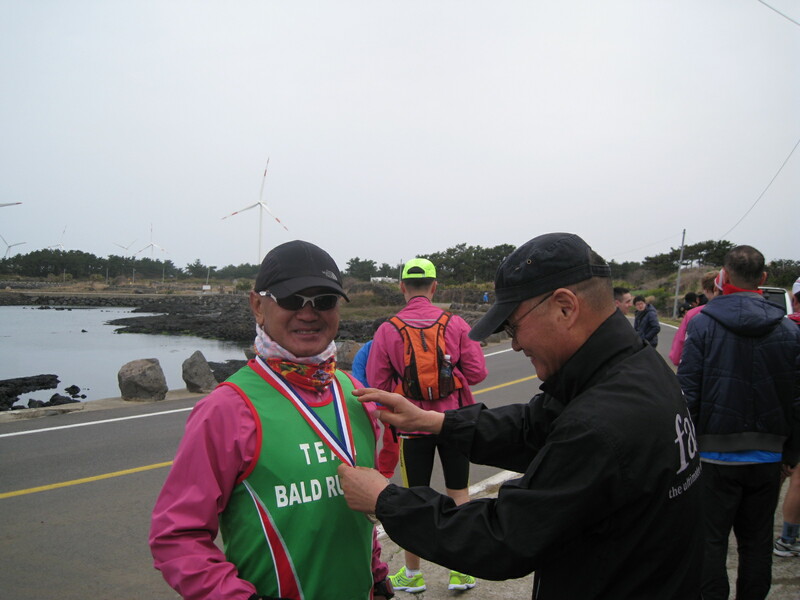 As of this morning, the Elite Team Bald Runner and PAU’s representatives to the 1st Asian IAU 100K Championship Race had arrived in Jeju Isalnd, South Korea. The place is nice, clean, orderly, cold and windy. 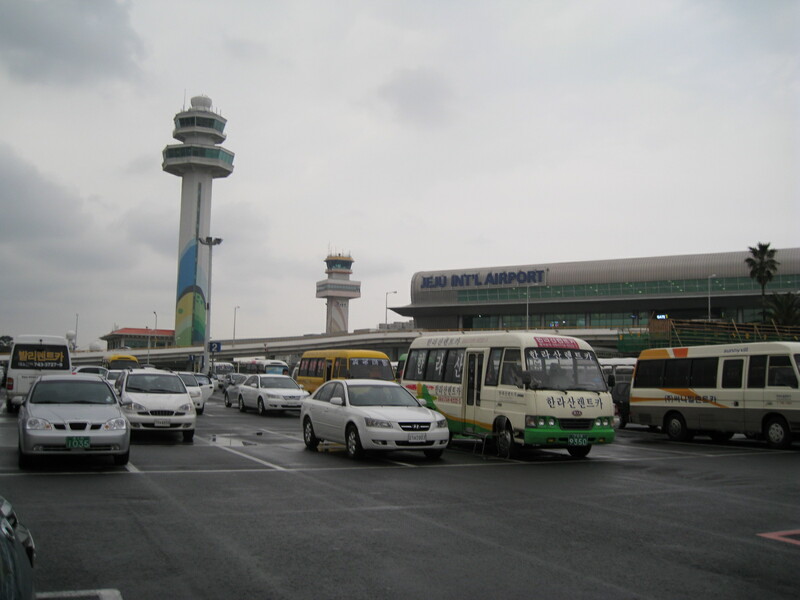 We were met at the airport by the representative of the Race Organizer and we were brought to our Hotel which is at the very center of Jeju City. It is very hard to find somebody here who could speak English! But by walking and jogging on the main streets of the city, we were able to find familiar fastfood establishments and shopping malls where to eat and buy much needed water, food and fruits. 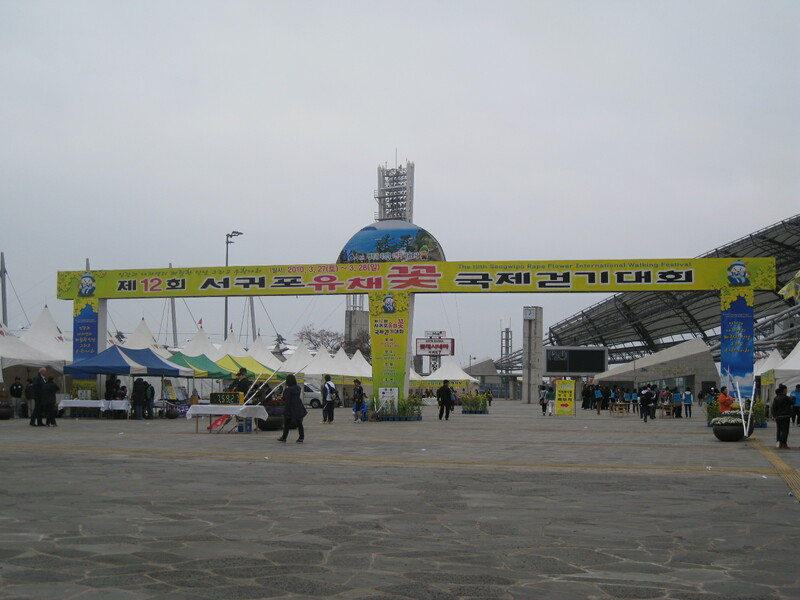 I found out later that this running event will also be the 9th Jeju International Ultramarathon Race and the Jeju International Cycling Race which will be held on the same day. The circumferential road of this island will definitely be dedicated to the ultra runners and cyclists on Saturday. Infront of a Car Repair's Shop!!! Tomorrow will be another day to run and acclimatize with the weather ( rainy, cloudy & windy) of the island. A formal program, briefing, and carboloading party will be held tomorrow afternoon. It would be a nice time to meet other international elite runners and ultra running sports federations leaders/officials. 1) The IAU 100K Championship Race (no cash prize for the winners, only medals will be awarded to the top 3 runners) will set the Philippine Record in 100K Ultramarathon Race in an IAU-sanctioned event. Winning this event is our ultimate goal but with Japan’s attendance/presence in this event, simply finishing and setting a National Record Time for the distance from our runners will be a great accomplishment already. 2) The Philippines, through the Philippine Association of Ultrarunners (PAU), will be represented to an IAU-sanctioned ultra race for the first time. This will expose our country to other ultrarunning countries. 3) The Elite Team Bald Runner goes International as we will be using our official uniform-singlet, courtesy of MILO/Nestle, Philippines. Once again, for those who supported and continued praying for us, thank you very much. God bless to everybody! 1. 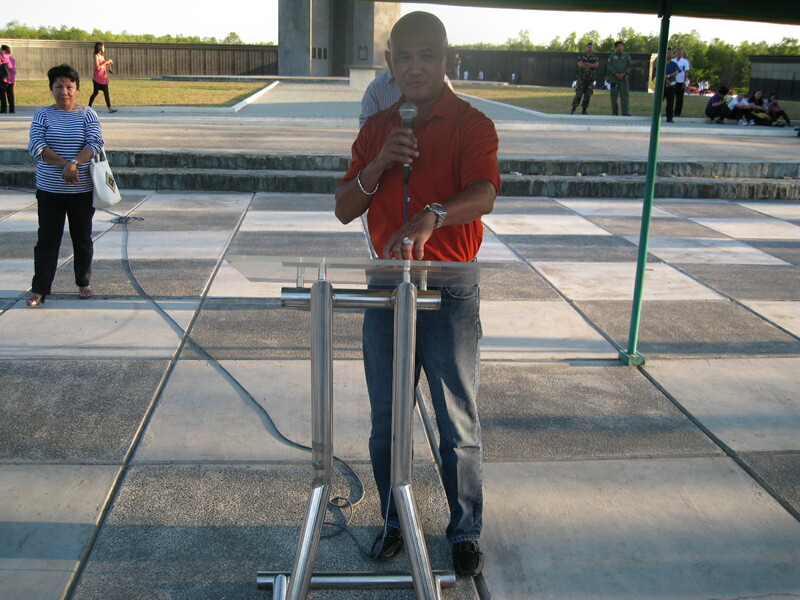 The Head of the Multi Agency Task Force (MATF) for the Observance of the 2010 Araw ng Kagitingan and Philippine Veterans Week and Administrator of the Philippine Veterans Affairs Office (PVAO), Honorable Ernesto G Carolina, sent an official invitation to me as the Special Guest during the Culminating Ceremony of the 2010 “Alay-Sikad Sa Kagitingan”: Retracing the Bataan Death March Route Bike-A-Thon held last Saturday, March 20, 2010, at the Capas National Shrine in Camp O’Donnell, Capas Tarlac. 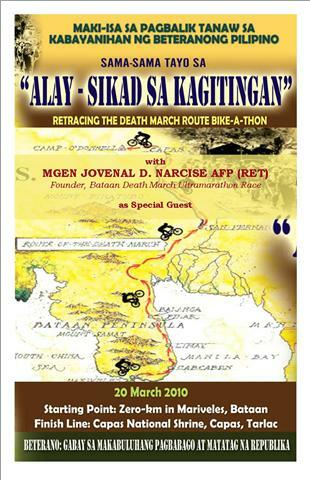 The Bike-A-Thon event is a part of the activities that commemorates and provides awareness to the infamous Bataan Death March. 2. I was chosen as the Special Guest for the said event because the MATF have been informed that I’ve been conducting the BDM 102K Ultramarathon Race for the past two years without their support. In the said program, I was introduced as the Founder of the BDM Ultramarathon Race. I am glad that my invitation to this event have finally recognized the efforts I’ve spent to create awareness on the heroism of our forefathers during World War II. 3. A group of almost 100 cyclists from the Armed Forces of the Philippines and other Bike Clubs in Metro Manila and other nearby provinces started the Bikeathon at the BDM Km 00 in Mariveles, Bataan at 6:30 AM last Saturday. A Ceremonial Send-Off Program was led by Hon. 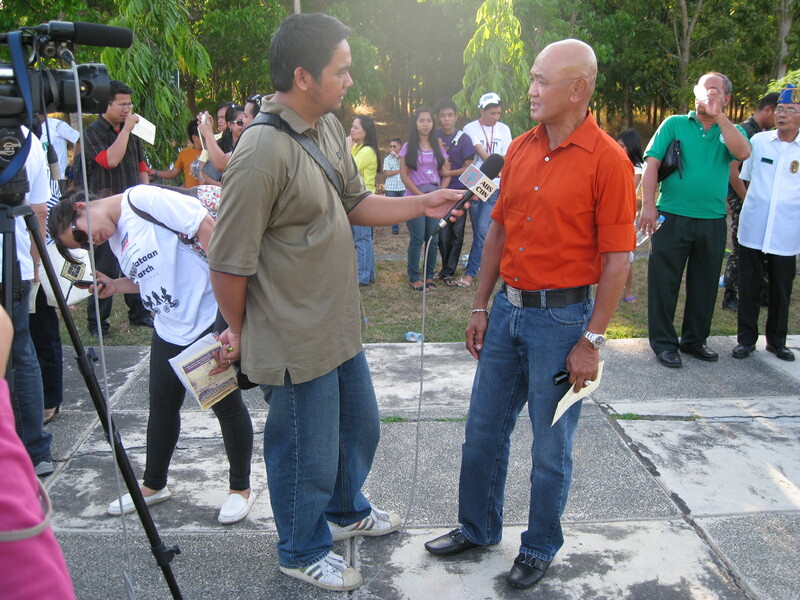 Jesse Concepcion, Mayor of Mariveles, Bataan; Hon. 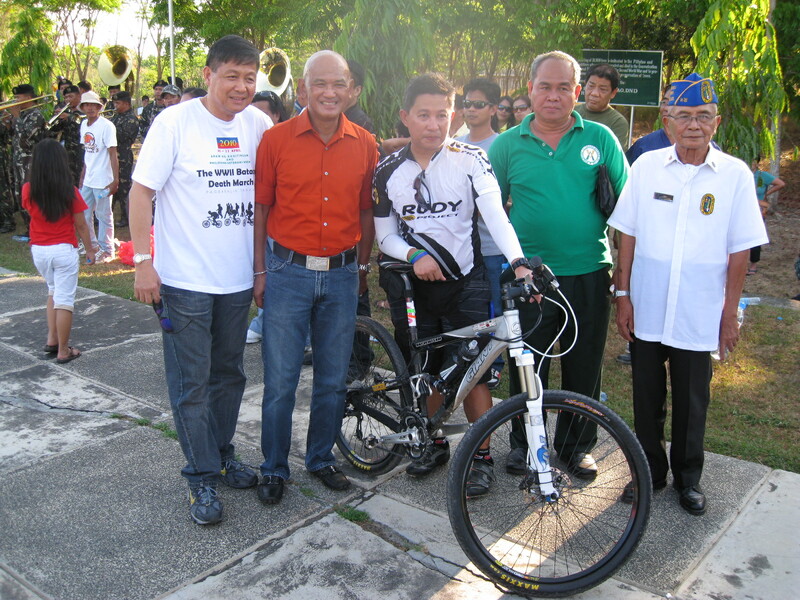 Espiridion Calara, Provincial DILG Director; and Ms Samsia Bonoan, Head of the MATF Sub-Committee on Bikeathon. 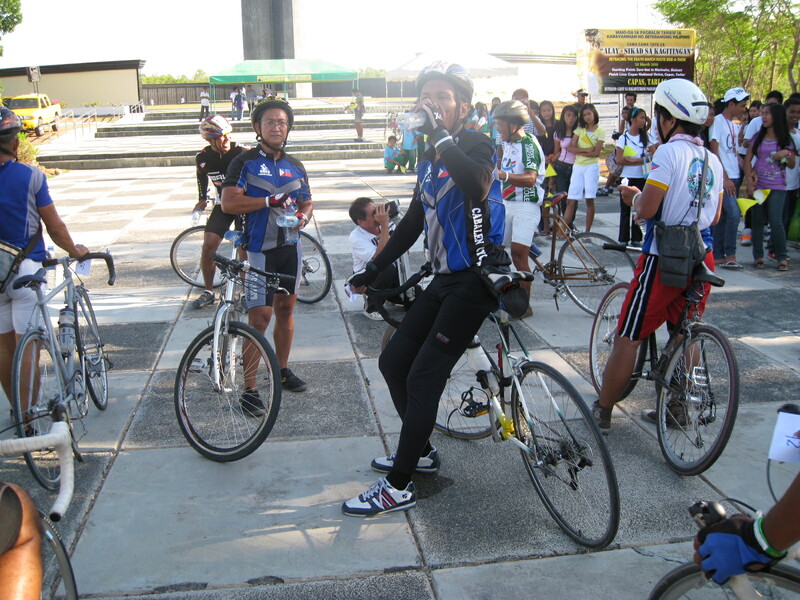 The number of cyclists increased in numbers up to 200 as they passed along the towns of Bataan, Pampanga, and Tarlac. 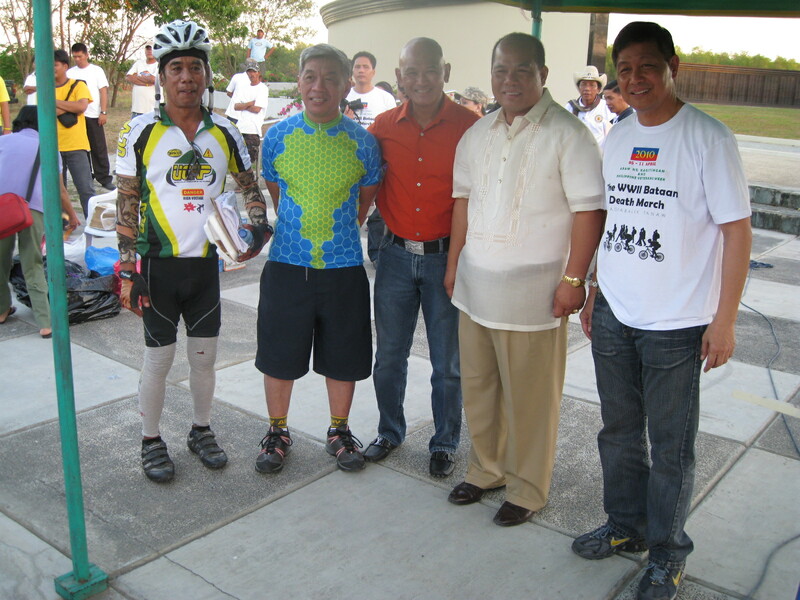 More cyclists have joined the group as it got nearer to the Finish Line at the Capas National Shrine. The cyclists arrived at the Finish Line at 4:00 PM. Aid Stations/Checkpoints had been pre-positioned every 50 kilometers where cyclists were provided with water and food. 4. 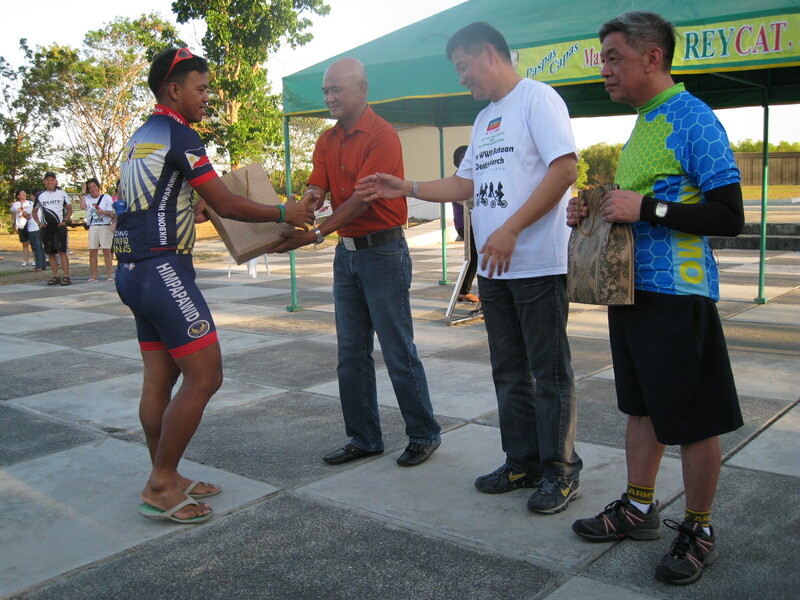 During the Culminating Ceremony, the Finishers were awarded with “loot bags” courtesy of MATF and PVAO. The activity was graced with the presence of Hon. Reynaldo Catacutan, Mayor of Capas and some of the veterans of World War II. I was able to deliver my message/speech with emphasis on the sustained awareness of the BDM through activities on sports, arts, tourism, and written publications/researches. Finishers Getting In Line For Their "Loot Bag"
5. Hopefully, the MATF & PVAO will be able to support the conduct of future BDM Ultramarathon Races. 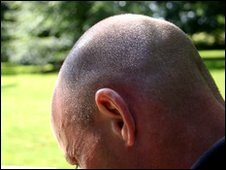 They were able to link high levels of the male hormone testosterone in those who lose their hair earlier with a lower risk of tumours. The findings are published in the journal Cancer Epidemiology. Dr Helen Rippon, head of research management at The Prostate Cancer Charity, says: “Clearly, the age at which a man begins to lose his hair is unfortunately not a risk factor for prostate cancer over which he has any control. “The results hinge on asking men between ages 40 and 70 to remember whether their hair was thinning when they were 30, which does not provide a very reliable measurement, ” she added. Who is going to join/participate in the 25th LA Marathon to be held this coming Sunday, 21 March 2010 which is dubbed as the “Stadium To The Sea” Marathon? I am sure my son John and daughter Jovelle will be joining this race as they had been participating in this event for the past years. I finished the 2009 edition of the LA Marathon last year which was held during Memorial Day on May 25, 2009 with a finish time of 4:09+ hours. But due to numerous complaints from runners because of the heat and overtraining and later, pressure from the LA City Government, the Race Organizers will be bringing back the usual schedule of the race on the month of March for this year’s edition. What is unique about this year’s marathon race is the change of the marathon route. The road race will start at the Dodger’s Stadium which is commemorating its 25th Anniversary and the runners will pass along historic and tourist attraction sites which are very unique in Los Angeles. From the Dodger’s Stadium, the runners go to the City Hall area and then proceed/pass along Echo Park (one of my favorite running parks) and then to Sunset Ave up to Hollywood Boulevard. Well, if you have the time, you can drop by in one of the Fashion Shops at Rodeo Drive and do your shopping while running the marathon. But having a camera while running this marathon would be a nice experience as you can take pictures on the sights of Fashion Signature Shops and flashy cars/sports cars parked on most of the roads where the route passes through. I guess, there is no need to run this Marathon Race in a PR pace. The joy, experience, fun, and the sights are the most important aspects why you paid and joined this Marathon Race. But what will be the most memorable experience in this Marathon is the presence of almost 1,000,000 spectators along the route who will cheer, offer water & sports drinks, some would be offering ice cold beer, and some would be offering food to the runners. I am sure that some rock bands will be along the route as what the race organizers had offered in the past editions of the race. The Finish Line will be at the Ocean Avenue in Santa Monica Beach. Finishing at the beach area in the Los Angeles Marathon will be a nice experience to all the runners. So, whoever will be leaving the country to join this memorable edition of the LA Marathon, enjoy your run and experience in this new route of the race. Have fun!